(December 4, 2018) — York’s “laugh at the cold” free winter celebration is not only back for 2019 but bigger than ever. 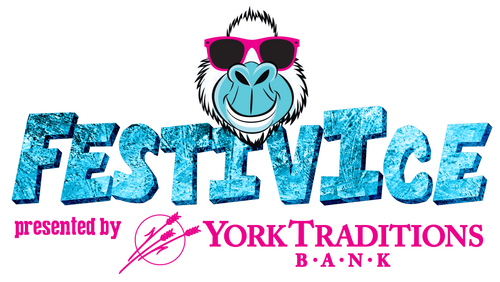 Officials at Eventive, the event planning and production division of the York Revolution, announced today that FestivICE, presented by York Traditions Bank, will expand for 2019 to span three days and fill Cherry Lane in downtown York with music, family fun, and – of course – its famous live sculpting of thousands of pounds of ice. FestivICE 2019 will be held January 17, 18, and 19. Details are available at www.FestivICE.com, which will be updated as more elements are added to the event. This year’s celebration will also serve as a fundraiser for Children’s Aid Society, which will receive a portion of each sponsorship of FestivICE’s famous ice sculptures. Chainsaw-wielding artists from DiMartino Ice Company will again turn more than 20,000 pounds of ice into frosty pieces of art throughout the three-day event, including a 40-foot ice slide for the celebration’s youngest attendees to ride for free. DiMartino artists will honor the late Dr. Martin Luther King on his holiday weekend by paying tribute to him and heroes inspired by his message in their ice sculptures. Ice sculpture sponsorships are available at www.FestivICE.com. The expanded winter party will kick off that Thursday night with a craft event by Creative York and a screening of The Incredibles at the Capitol Theater, both part of CelebrateARTS, an initiative of the Cultural Alliance of York County. York Young Professionals will host a social at Cherry Lane as well. Friday’s schedule to date includes live ice carvings and a free silent disco after party at the Appell Center for the Performing Arts, also part of CelebrateARTS. Saturday will feature a full day of family friendly activities, live music, fire pits, s’mores, and more. The complete FestivICE schedule will be announced in the coming weeks.